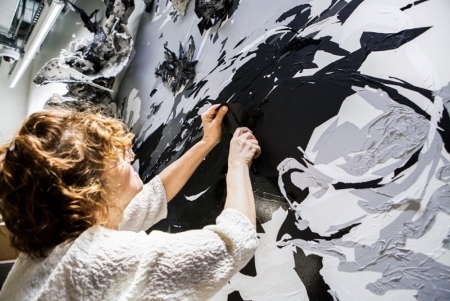 Using tape, paper, and other unexpected materials, Debra Weisberg (Drawing Fellow ’08) explores the boundaries of drawing. 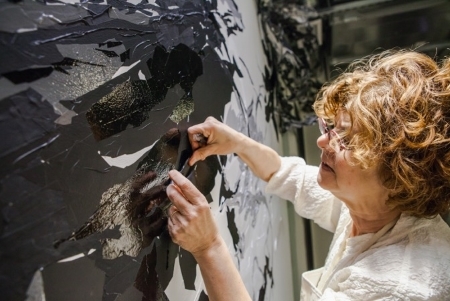 Here, she discusses a recent commission to create a large-scale installation as part of the Facebook Artist in Residence Program. 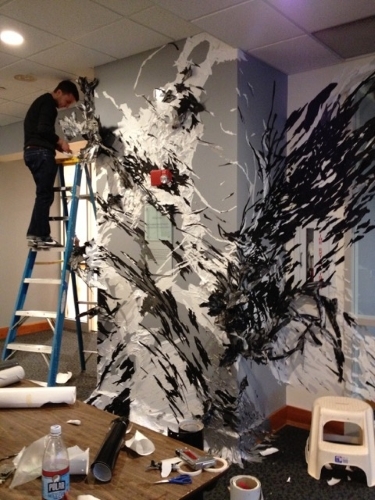 I recently completed a 22-ft long commission for Facebook Cambridge Office, done mostly on-site over a 10 day period. 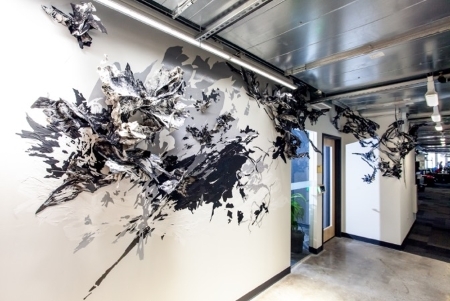 The installation was made using black and white tape, vinyl signage tape, and pre-fabricated paper based sculptural elements. 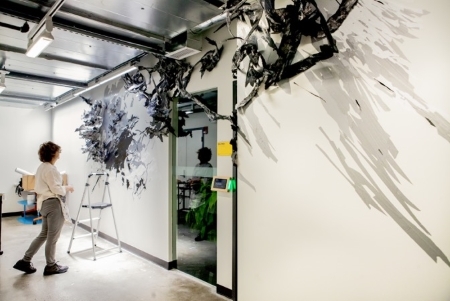 The tape and sculptures were applied directly to the wall/ceilings emerging from and contrasting with the angularity of the industrial aluminum pipes and ducts – the poetry of the hand-made bumping against the manufactured – using an industrial material to create the illusion of the ephemeral. All of my work is rooted in drawing, which I define, following anthropologist Tim Ingold, as “an indelible record of the pressure of the fingers on the pencil that makes it, driven by impatience, control, or anxiety of the maker… an archive of the maker’s muscle.” For me, the act of drawing is dynamic, improvisational, and mutable inside any installation. Part of my studio practice also includes temporary large-scale collaborative drawing projects with students in public and private high schools, museums and in colleges including Wheaton College, St Paul’s and Milton Academy. I recently created collaborative drawings with students from Wheaton College over a ten day residency (see below). These installations are tailored to meet the budget and time schedules of the supporting institutions and remain up from 6 weeks to a year, as in the case of Milton Academy. 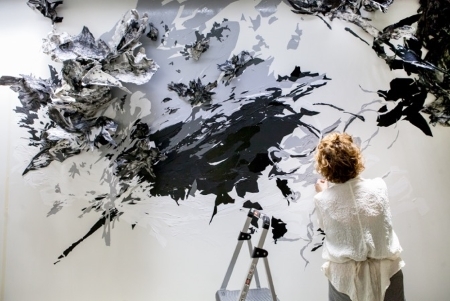 When collaborating with students, one of the main goals is to expand their definition of drawing and to adapt their prior drawing methodology into a physical relationship with the architectural space by using a malleable material to generate the gesture and mark instead of a pencil or piece of charcoal. Image: all images courtesy of Debra Weisberg. Photo credit: Simone Scheiss.